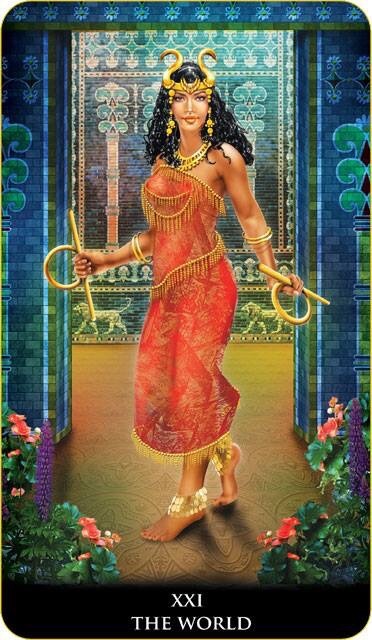 A woman in a red dress has both female and male features, and she holds the Babylonian measuring tools in each hand. This card avoids traditional Christian symbolism, choosing to explain the universe in the Babylonian cosmogony terms as the perfect union of the heaven and earth. Anki is a creator of the world, the god in whom two halves were united: male An (father of gods and the heaven) and female Ki (mother of gods and earth). Anki represents cosmic consciousness, the wholeness of the universe, and a cycle of life. According to the Babylonian myth of creation, in the beginning, there was only the primordial water (Tiamat) in total darkness until Tiamat gave birth to Anki, who united heaven and earth. The Anki’ son, the air god Enlil, splited the universe in two, creating An, the god of the sky and Ki, who became the goddess of earth. The World represents completion, fulfillment, and integration, as well as achievement of goals. In a Tarot reading, this card reflects situations of accomplishment and enjoying of peace of mind, seeing dreams coming true, and feeling blessed. A person can achieve his or her heart’s desire, finding the best solution during the life path, achieving success, and having prosperity. This entry was posted in Artist, Deck Review, Featured Card of the Day, General Tarot, Readings and tagged New Babylonian, Roxana Paul, Tarot, World.